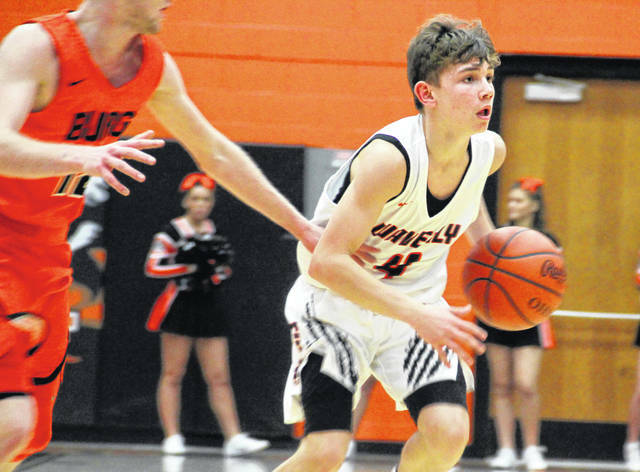 Wheelersburg’s Dustin Darnell looks for an open teammate during the first half of Friday’s 69-46 win at Waverly. Waverly’s Trey Robertson scored six points in Friday’s 69-46 loss to Wheelersburg. 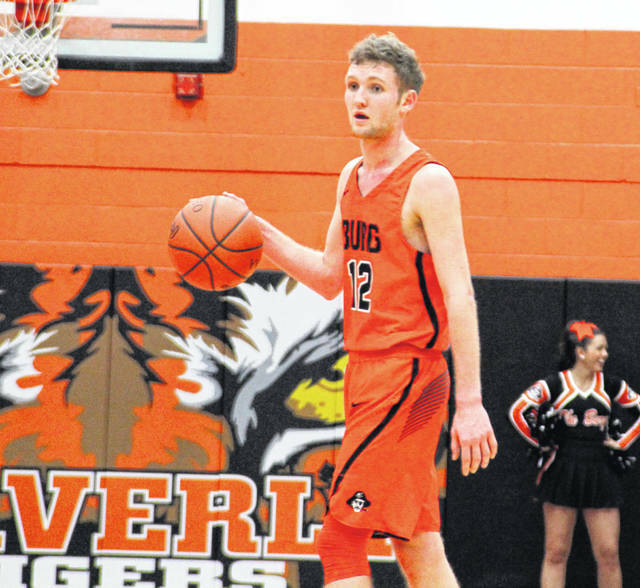 Wheelersburg’s Connor Mullins led all scorers in Friday’s 69-46 win over Waverly, scoring 21 points behind five 3-point field goals. WAVERLY — With Tanner Holden and J.J. Truitt on the bench, you’d think Wheelersburg would be a little less dangerous. As it turns out, that’s not the case. With their two leading scorers forced to spectate, the Pirates not only played well; they continued to build an early lead — one that built the foundation of a 69-46 SOC II win at Waverly. 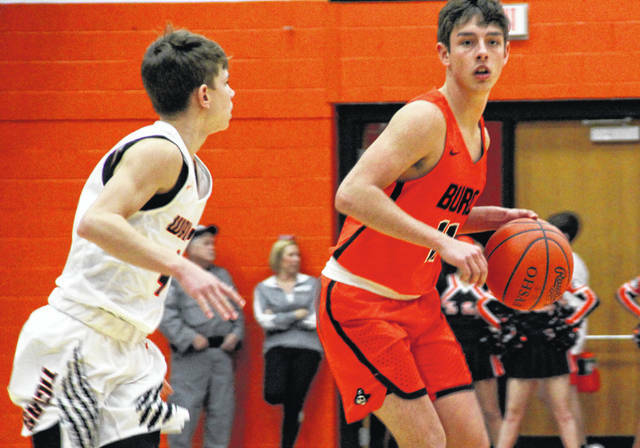 The victory guarantees Wheelersburg at least a share of the conference title. Mullins was huge in the win, scoring a game-high 21 points behind five 3-point field goals. When he was left open in the corner, it was almost a guaranteed bucket. Salyers joined that party, tallying 13 points, most of which came at crucial times in the ballgame. But the most important cliff note to Friday’s win? The No. 2 state-ranked Pirates (18-0, 11-0 SOC II) played better on the defensive side of the basketball. Holden scored Wheelersburg’s first two baskets, giving the Pirates an early 4-2 lead. But he soon found his way to the bench in foul trouble, giving way for Truitt and Salyers to shoulder the load. Salyers broke a 13-13 tie with a 3-point play, sparking a quarter-ending 8-2 run as ‘Burg took a 21-15 advantage into the second. When the second started, the offensive onslaught continued … much of which happened with Holden and Truitt watching alongside Ater. Mullins two of his five 3’s in the second while Salyers and Carter McCorkle added in a combined six points. Holden added four late points when he reentered, giving the Pirates a comfortable 39-22 lead at the break. Though Waverly (12-6, 8-3 SOC II) went punch for punch with ‘Burg in the third, actually winning the quarter 15-13, the Pirates once again pulled away in the fourth behind two more 3’s from Mullins’ hot hand. Marquez led the Tigers statistically with 15 points while Wolf ended with nine points, eight rebounds and two assists. Ethan Dunn also had nine points and Trey Robertson had six. Mullins led all scorers with 21 points while Holden finished with 14 points and 11 rebounds. Salyers ended the evening with 13 points and seven boards, Truitt had seven points, and Miller added four points, three rebounds and a game-high five assists. While Waverly attempts to bounce back Tuesday, hosting Jackson, Wheelersburg will look for its 19th straight win this coming Friday, hosting West. Wheelersburg: 26-54 FG, 10-15 FT, 7-20 3pt. (Mullins 5), 36 rebounds (Holden 11), 12 turnovers, 11 assists (Miller 5). Scoring: Mullins 21, Holden 14, T. Salyers 13, Truitt 7, McCorkle 5, Miller 4, J. Salyers 3, Darnell 2. Waverly: 16-46 FG, 11-23 FT, 3-10 3pt. (Robertson 2), 24 rebounds (Wolf 8), 12 turnovers, 4 assists (Wolf 2). Scoring: Marquez 15, Dunn 9, Wolf 9, Robertson 6, Shoemaker 4, Remington 3.